Every citizen is being asked to read this one page. 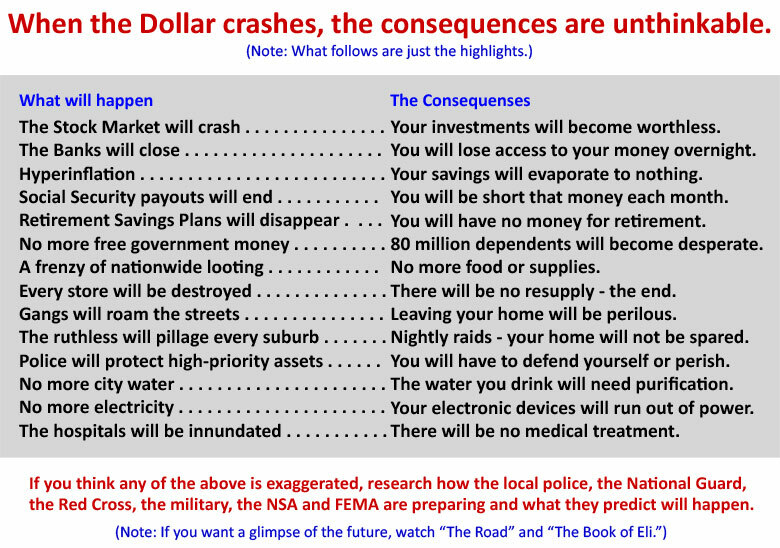 How old will you be when the U.S. Dollar crashes? What will happen when there is no more free money? When every store is looted and destroyed, what will you do? The Democratic and Republican parties are not true political parties. 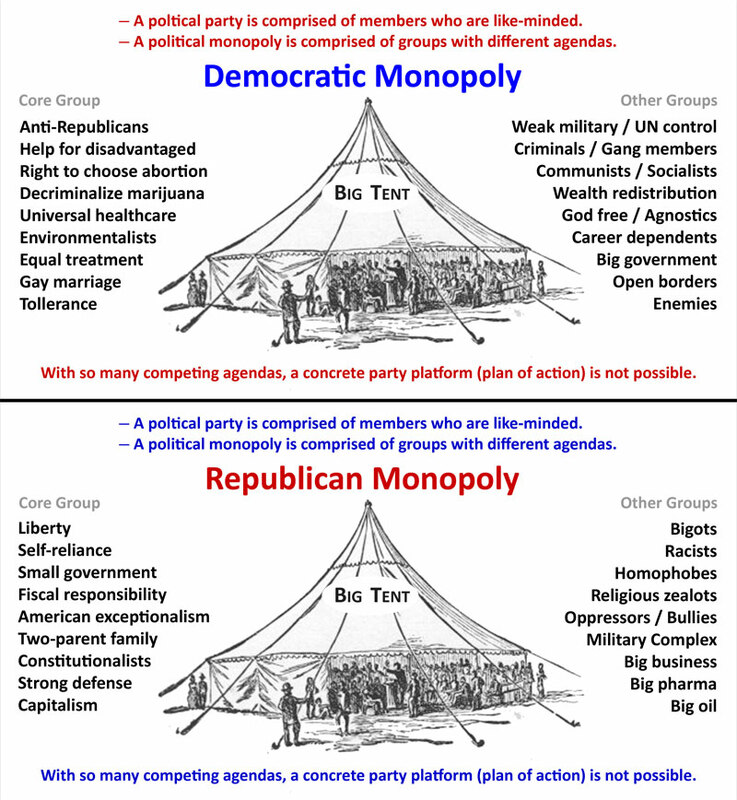 They are monopolies comprised of diverse groups with different agendas. This is why they do not put forth a concrete platform (a plan of action). 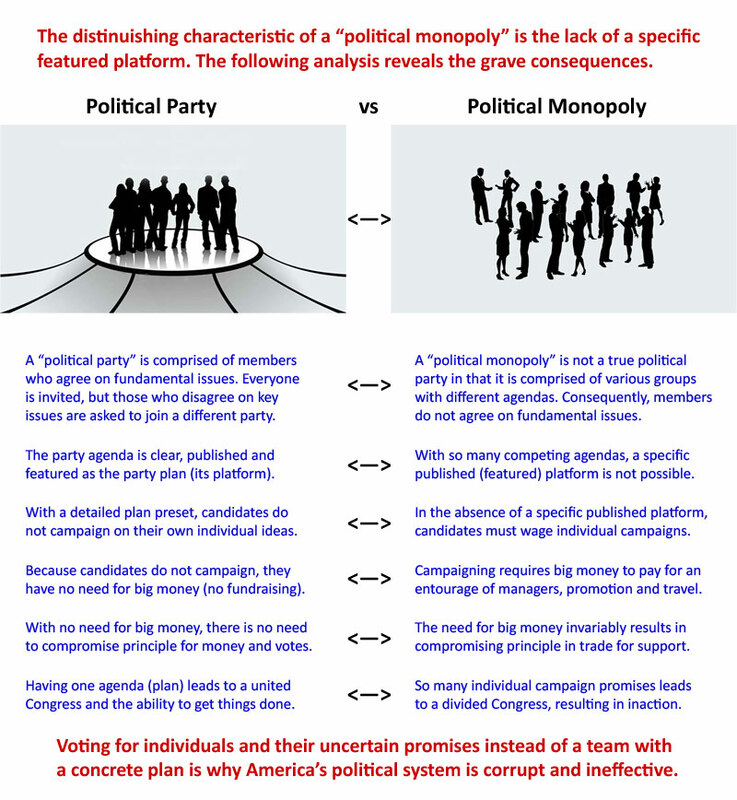 Candidates of true political parties do not campaign. They stand on their party platform. Not having a platform forces Democrats and Republicans to campaign. Campaigning requires money resulting in corruption. Democrats and Republicans have made social problems worse from applying “Spring Theory” (the wrong psychology) since the 1930s. Vote for Patriots at all levels of government. Working as a team, we will restore the Constitution, take the big money out of politics, apply the correct psychology to social problems, and ensure America's sovereignty, solvency, exceptionalism and leadership position. 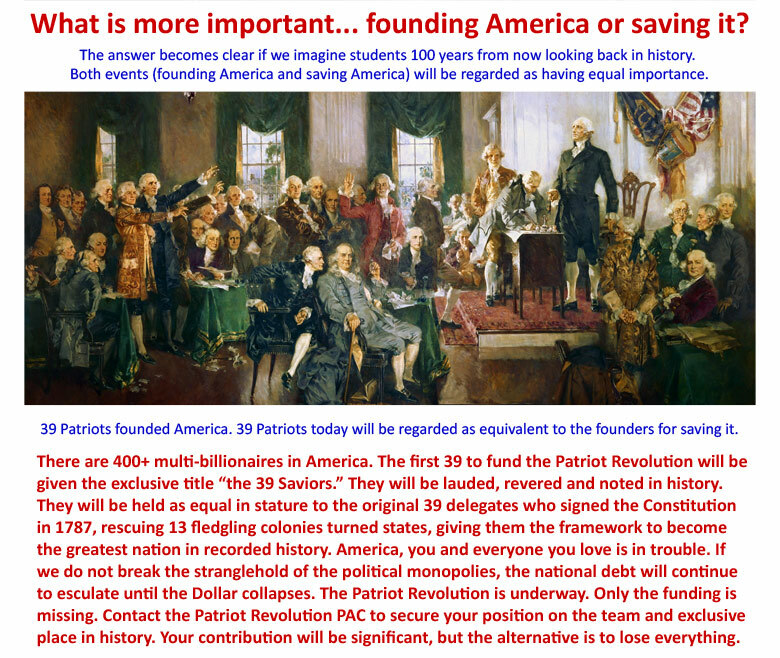 Akin to the 39 signers of the U.S. Constitution in 1787, 39 heroic billionaires will fund the Patriot Revolution to save America. Become a Delegate, Manager or Representative. No campaigning! — No fund raising! — No pandering! — No pork! Twelve Things on which Patriots Agree! No more Democrats! No More Republicans! If you don't get involved, you are the problem! Listen to the entire website in pod casts @ Patriot Broadcasting Network. The ramifications of understanding human nature are many. 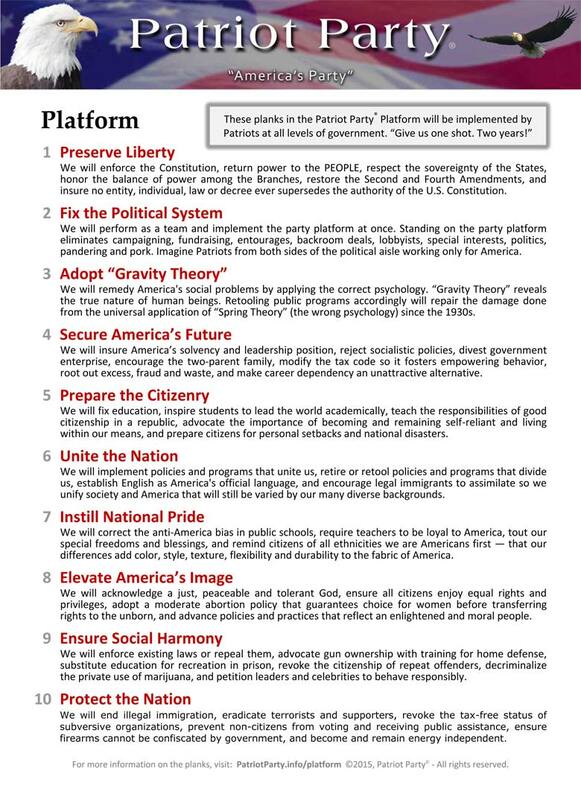 The Patriot Party® is an emerging political party that endorses the application of Gravity Theory and the Bidirectional System as the way to resolve America's social, financial and political problems. 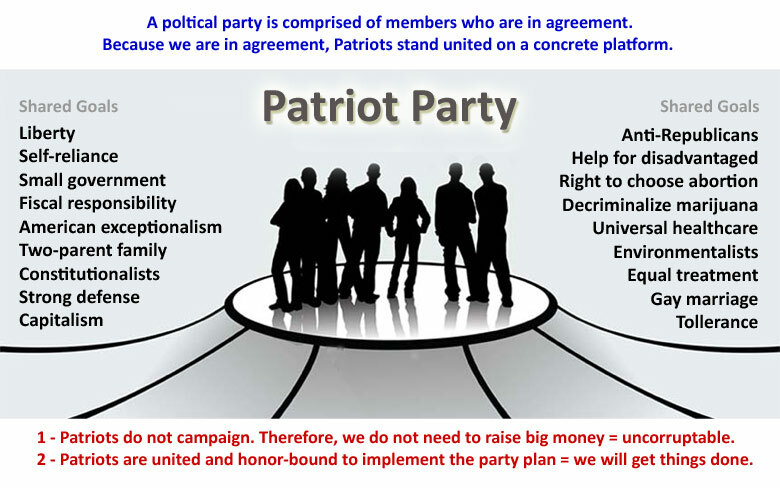 Patriot Party Radio broadcasts the Patriot Party® message. Spring-Gravity Theory® is a marketing group that applies the teachings of Humanology® in crafting marketing plans and advertising campaigns for the largest companies and nation-states worldwide. 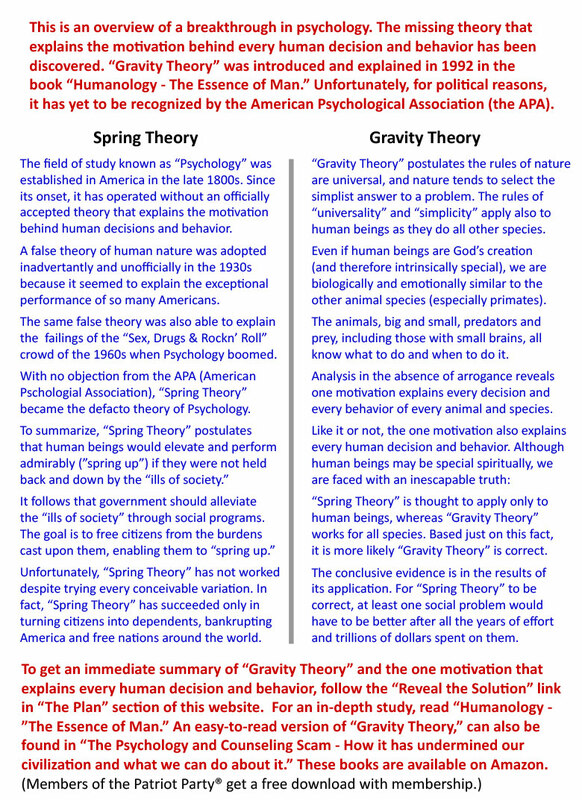 Spring-Gravity Theory® is the result of a breakthrough in understanding human nature. That breakthrough is featured on the Humanology® website. More and more organizations are adopting the knowledge offered by Humanology®. Foundation to Empower Marriage is a non-profit organization dedicated to educate high school seniors on how emotions work and how to use that knowledge to form and maintain successful long term personal relationships including marriage. It's Not About Love is a musical written for high school and college students. It reveals the secret to success in romance and fulfillment in marriage. It's message is based on the knowledge and discoveries of Humanology®. School Is Cool is a not-for-profit corporation that works with the major sports associations in elevating the value of education in the minds of our children. Fittest Form® is a program that helps people achieve their best physical and mental state. Idea Songs is a group of songwriters that applies Humanology® in crafting songs, with an eye on making the most impact and maximizing audience appeal. Professional Songwriter Group is an association of lyricists and composers that study human nature and incorporate that knowledge into their musical works, making their products more impactful on the listening public. Back On Top Music is a publisher of music that works only with authors who understand and incorporate what we now know about human nature. Magyar Music is a music act that incorporates Humanology® when crafting its songs. The author of Humanology®, Don Magyar, can be contacted directly by going to his website. His books are individually titled and can stand alone, yet they are part of the Humanology® series, published by Permanent Publications. Restore the U.S. Constitution and ensure rights cannot be suspended even under Marshal Law. Choose nationalism over globalism, sovereignty over submission and liberty over oppression. Drain the swamp, root out traitors, reject UN interference and free us from foreign control. Place the intelligence agencies and deep state organizations under the purview of Congress. Reduce the size, reach and elitism of government, returning power to the States and The People. Ban foreign troops from American soil and foreign nationals from the military and police actions. Enforce immigration laws and deny illegal immigrants amnesty, the vote, and public support. End the Islamization of America and expel those who are working to destroy our way of life. Ensure news, search engines and social networks are free of censorship and foreign control. Revoke the tax-free status of charities that advocate violence, division or subversion. Employ teachers who advocate liberty over socialism, fascism and other leftist ideologies. Reveal the truth regarding chem-trails, GMOs, vaccinations, fluoridation, false flags and pedogate. On these 12 Directives Patriots stand! That you have come this far proves you are a Patriot at heart. Before you go to the “Join” page, we want to summarize where we are and the journey ahead. Electing Donald Trump was an amazing and exhaustive victory. Although he is flawed, he was the best person for the job at the time. He may not employ the best strategies and tactics on every matter, but he is moving America in the right direction. As such, we support him absolutely. A great deal of effort and sacrifice was needed at a most critical time. Congratulations to us all for a job well done. As predicted, President Trump will not be able to change America without the cooperation of Congress. Forgive the analogy, but we are like a football team that has marched down the field and finds itself in the “red zone.” We Patriots must regroup and re-energize, and together put the ball in the end-zone. Ask everyone you know to read just one page (PatriotRevolution.info). Cut and Paste the following notice on FaceBook and your other social networks (coming shorty). God bless you, those you love and America.